PAWTUCKET, R.I. -- The Bison squared off with the PawSox in a doubleheader Tuesday night from McCoy Stadium. While the Herd blanked Pawtucket in Game one, 4-0, the opposite resulted in Game two with Buffalo dropping the contest, 6-0. In Game one, Bisons' starter Ryan Borucki shined as he threw a complete game shutout in the condensed seven-inning game, leading the Herd to a 4-0 win. In Game two, Pawtucket scored three runs early and tacked on a three-spot in the fourth to put the game away, 6-0. Borucki needed 93 pitches to go the distance. He sat down Pawtucket in order in five different frames throughout the game and struck out four. The southpaw yielded just three hits--all singles. After holding the PawSox hitless between the fourth through sixth innings, Borucki surrendered a pair of infield singles in the seventh. He preserved the shutout by getting Mike Olt to pop out to catcher Danny Jansen with two runners aboard to end the game. 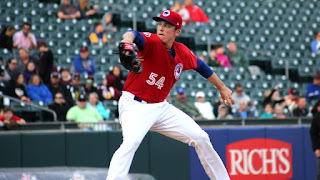 The Bisons needed just three batters to kickstart the offense against the PawSox. After Dwight Smith Jr. and Richard Urena reached base on a walk and a base hit, rehabbing Steve Pearcebarreled up a low and inside pitch and hit a no-doubt, three-run home run to left field. This handed Buffalo a 3-0 lead in the first. Buffalo added to its lead in the third. Jansen led off the inning by ripping a double down the third base line. He later scored on a throwing error from Pawtucket second baseman Ivan De Jesus Jr.trying to throw out Rowdy Tellez at first base. This is all the offense the Bisons required in the shutout victory. Jansen and Richard Urena both had multi-hit games. In addition to the double, Jansen collected a single and drew a walk. Urena registered a pair of singles-one in the first and one in the seventh. The PawSox took a 1-0 lead on RBI-single from Adam Lind in the first. Pawtucket increased its lead to three in the second on a two-run, two-out single from Rusney Castillo. The PawSox scored three more in the fourth on a two-run home run by Tzu-Wei Lin. Then, Adam Lind brought home Castillo on a fielding error. Unlike Game one of the doubleheader, the Bisons couldn't get much going offensively. The Herd was limited to just four hits in the nightcap. Buffalo only tallied one hit in the first four innings of the game but had a promising start to the fifth inning. The Bisons got two aboard on singles by Leblebijian and Reese McGuire but couldn't bring any runs across in the frame.